The diagram below shows a typical supply and demand diagram illustrating the interplay of demand and supply forces for a typical house market (2 bedroom houses). Price and quantity purchased are determined at the point where the supply curve and demand curve intersect at “A”. Price P and quantity Q at this point are called the equilibrium price and equilibrium quantity respectively. At price P, the quantity of 2 bedroom houses offered for sale (supplied) and the amount of such houses purchased (demanded) are equal. Any movement away from the equilibrium price would be resisted by the automatic workings of the market place. If the price was raised, the amount demanded would fall and vice versa. This would not be a stable situation as for example, the "glut" or oversupply would force to lower their prices to move stock until price P was established. The equilibrium price changes whenever the factors affecting supply or demand change. For example, the diagram also illustrates the effect of an increase in supply. New production techniques or a decrease in interest rates make it cheaper to buy a house. 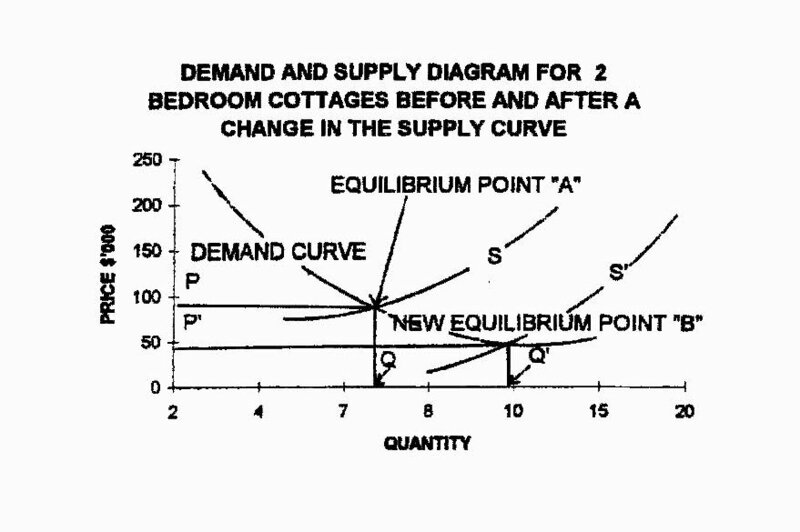 As a result, producers are willing to supply a larger number of houses at each price resulting in a new supply curve; “S’” and causing a new equilibrium point “B”. In an unchanging world of perfect knowledge the price corresponding to the intersection of supply and demand would be established quickly and would be stable. The price is in equilibrium because the forces are in balance. However, in property markets the nonprice determinants of demand change frequently thereby, causing shifts in the demand curve. Prices and quantities sold are seldom stable for long and therefore, equilibrium does not remain long and is constantly changing. That is, the curves are more representative of a dynamic steady state market than a slow moving fixed market.